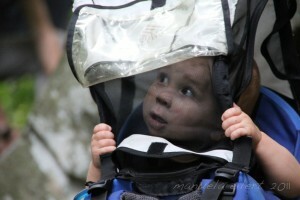 I’d be lying if I said I wasn’t looking forward to the day when Cragbaby could hike his 25 pound self into the crag on his own two feet, and my husband would for sure be lying if he said he won’t be waiting to replace that weight with 25 pounds of gear from his own pack on the day that happens! But for now, we’ve got a pretty good system – hubby hikes in ALL of the climbing related gear – rope, quickdraws, rack, harnesses, shoes, etc (thankfully our “third man” can usually take some of that burden), while I hike in both of our food, water, diapers, any other miscellaneous baby gear, and of course, Cragbaby himself. The perfect setting for a mid-day snooze! I don’t even wanna know how Steve’s backpack would fare on the scale (but I have all I can do to lift it off the ground…). However, I would wager that mine would come in around the 40-45 pound mark, of course being its heaviest at the start of the day (as if I needed an incentive to drink more water/eat more food!). This would account for 25 pounds baby, 7.5 pounds pack, and 8 pounds food and water, with cloth diapers and other etcs adding a couple pounds here and there. However while this might sound rather extreme on paper, choosing the right pack can make the difference between arriving at your destination full of energy, versus stumbling in bent over with an achy back. Ordinarily our family swears by Osprey – between my husband and I we have 5 packs (two 60-70L for backpacking, two 35L cragpacks, as well as a small kid’s daypack that I use for my everyday diaperbag/purse.) However our beloved Osprey doesn’t make any backpacks suitable for kid-toting (although rumor has it that’s about to change in 2012.) 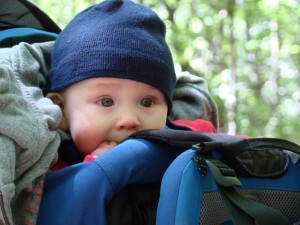 So like any good first-time expecting parents, we did our research – and settled on the Kelty FC 3.0 Kid Carrier. 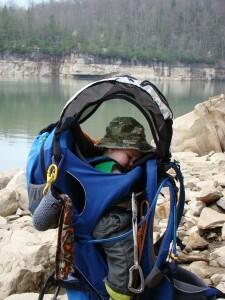 Kickstand – Yes, it makes it easy for me to get Cragbaby in and out by myself, but what makes the kickstand worth its weight in gold is the fact that C can fall asleep on the hike and then STAY asleep at our destination (without having to stay on my back). 5 point Adjustable Harness – No matter whether its long hikes on even ground, 4th class scrambles, or even ladders and fixed lines, I know my little bean is safe, snug, and comfy inside the pack. Protective Hood – Not only keeps the sun out of C’s eyes, but also keeps him out of range of stray tree branches that might inadvertently snap back in his direction. Fully Adjustable Straps – The waist straps and sliding torso adjusters make this pack transition smoothly between mine and my husband’s obvious size differences. Amazingly enough, it fits both of us really well. Outer Gear Loops – Used for toys and extra gear, these loops allow us to keep some toys and gear on the outside of the pack so C can get to them mid-hike if he would like. Durability – This pack has seen some pretty hard-core action over the past year, and so far, looks no worse for the wear. We haven’t gotten any holes, all of the zippers are still in tact, and the pack is surprisingly still the same bright shade of blue that it was initially. Storage – The back panel doubles as a removable backpack (which we’ve yet to use but I think could come in handy when C starts wanting to hike himself). For right now however, I wish the back panel had more storage. Although that combined with the storage compartment underneath the seat is exactly enough room for the gear we need, it is always packed to the brim, with not even so much as an extra ounce of space. Lack of Hydration System – But I’ve seen pictures of your pack with Cragbaby sucking away on a camel-back tube, you might be saying! That’s because my clever, engineering husband was able to rig a homemade hydration system throughout the pack. Although ingenious, the idea was really quite simple to carry out, so if you are interested in adding hydration to your set-up, you can check out Steve’s post on it here. This is a great pack that I would recommend to any expectant parent in the market for a backpack carrier. Although I can’t say its perfect, I can say that its a high-quality product that active families will more than get their money’s worth from. The verdict – 4 out of 5 Cragmama stars! Great review! 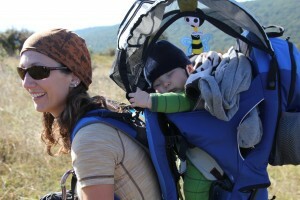 We use the Deuter Kid Comfort II and love it. In addition to the good things you point out about the Kelty, it has great storage and a hydration pocket. We wrote a 2 part review of that one. The shoulder strap adjustment system on the KC is really cool too. We wrote a 2 part review/primer of the KC II and III a few months ago, and really liked the ease of using, wearing and adjusting to KC. i meant to add some disclosure about our comment; we are Family Ambassadors for Deuter, but bought our KC and wrote the review/primer well before we became ambassadors. We have friends with the Deuter, and I’ve heard good things. We chose the Kelty over the Deuter III b/c althoguh it had an extra 2 liters of space, it didn’t have a wide enough range or torso adjustment for both my husband and I to wear comfortably. The Deuter II that you guys have is actually the same size as our Kelty – we just have a lot of gear when we go climbing all day 🙂 We were pretty psyched to rig the hydration system – but it would have defintiely been nice had it been already included. Thanks for commenting! 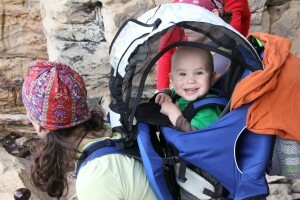 @cragmama reviews kid carriers for the crag. http://t.co/dXAGRxzb We can attest that this is a great brand! I just want to add…I don’t know how old your kid is, he looks about 18mon…anyways, be prepared to use that thing forever. I kept thinking that by the time he could walk really well, he would be fine hiking by himself. This is sooo not the case. He’s 2.5 and we are using our Kelty (a base level one, so no extras) now more than ever. I took him on a .7 mile hike in to do some bouldering at Cotton Top in NRG last week….holy cow, the hike in took me some 40 minutes…and he walks like a crazy drunk man, gets distracted, stomps in all the puddles…on the way back I gave up and carried him on my shoulders. Definitely should have just put him in the carrier and been done with it. Nina – Sweet, perfect timing! I was actually getting ready to send you an email about how you pack in. My two year old is still too small to hike herself. However, at 31+ lbs, I am really looking at ideas for a better pack and how to get all our stuff and us without breaking our backs. Our second hand pack isn’t back, but there is no shade, so Naomi has taken an branch to the forehead.